Hello, dear readers of the Folger Production Diary! This is your friend Louis Butelli writing you once again. How’ve you been? The reason for this entry is to proudly announce a brand new collaboration between myself, director Robert Richmond, Folger Theatre, and Folger Shakespeare Library’s upcoming traveling exhibition, First Folio! The Book that Gave Us Shakespeare. In 2016, to commemorate the 400th anniversary of Shakespeare’s death, the original 1623 First Folio – the first published collection of the 36 plays – will travel to all 50 states, Washington D.C., and Puerto Rico. Tour locations include 23 museums, 20 universities, five public libraries, three historical societies, and a theater. For the First Folio! tour, the rare book will be displayed open to one of the most quoted lines in the world, “to be or not to be” from Hamlet. Louis as the Gravedigger. Photo by Teresa Wood. Louis is ready to travel! Photo by Teresa Wood. The Gravedigger with the Folio. Photo by Teresa Wood. Taking inspiration from this, and from our deep and profound love of the play, Robert and I have devised a brand new solo performance piece called Gravedigger’s Tale to accompany the First Folio in its travels. In Act V, scene 1 of Hamlet, Hamlet and Horatio come across a gravedigger at work on the grounds of the palace. Graham Hamilton as Hamlet, Folger Theatre 2010. Photo by Carol Pratt. 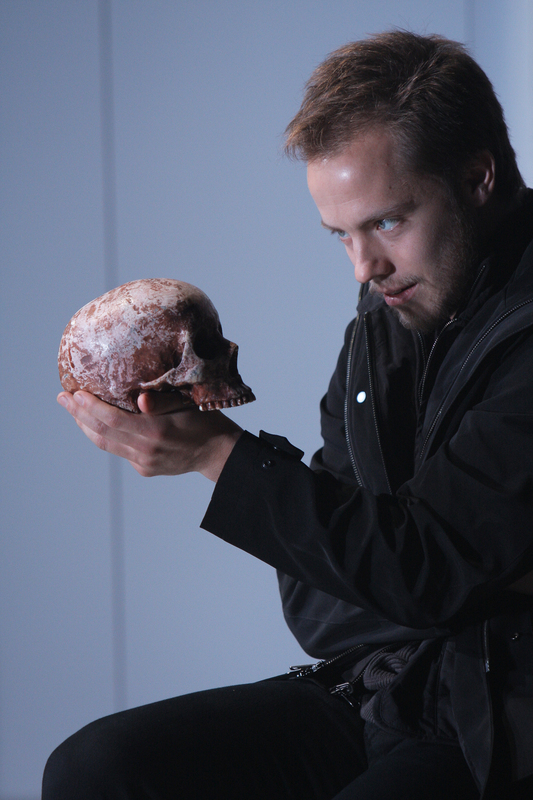 He sings a song as he goes about his business and, through the course of his conversation with Hamlet, he produces Yorick’s skull which he hands to Hamlet, providing one of the most iconic images in the history of the theater. Click here for more on the gravedigger in the Folger collection. Robert and I have great love for this cheerful gravedigger and we wanted to build a show for him. Our conceit is that those who work in service positions in great households often know quite a bit about the comings and goings of the household than one might suppose. What if, we wondered, many years after the events of the play, the gravedigger decided to tell us the story of the Danish prince. Taking the format of a “question and answer” session with the audience, Gravedigger’s Tale uses language from Hamlet to tell the story through the gravedigger’s eyes. In 50 minutes, audiences are taken on a whirlwind tour of the play, and hear language from the Ghost, the Player King, Queen Gertrude, Ophelia, Polonius, Horatio, the Gravedigger and, of course, Hamlet himself. We’ve built an interactive piece: audiences are asked to participate in a variety of warm-spirited and often hysterically funny ways as you can see in the video below. Additionally, since the tour will inevitably visit some places that don’t necessarily have a theater space on-site, we recently conducted an experiment in “pop-up” theater where our piece performed in some, shall we say, unconventional venues. In collaboration with the excellent White Heron Theater, I visited Nantucket, MA for a week to present five performances of Gravedigger’s Tale. The reactions were fantastic when I performed at the Samuel Owen Gallery downtown, in the lush dining room at the Westmoor Country Club, in a greenhouse for a farm-to-table dinner at Bartlett’s Farm, and on a beautiful patch of lawn behind gourmet sandwich shop Something Natural. Our show is truly big-hearted. It is a valentine to Hamlet and to William Shakespeare. Folks have reported to me that they laughed along with the jokes and the audience interaction, but that they also were brought to tears by, for instance, the speech in which Ophelia’s death is recounted. Most important to me, is that it gets people talking. My hope is that you will follow along on this adventure: I will be posting updates here periodically, along with pictures and video so you can follow the gravedigger across the country. 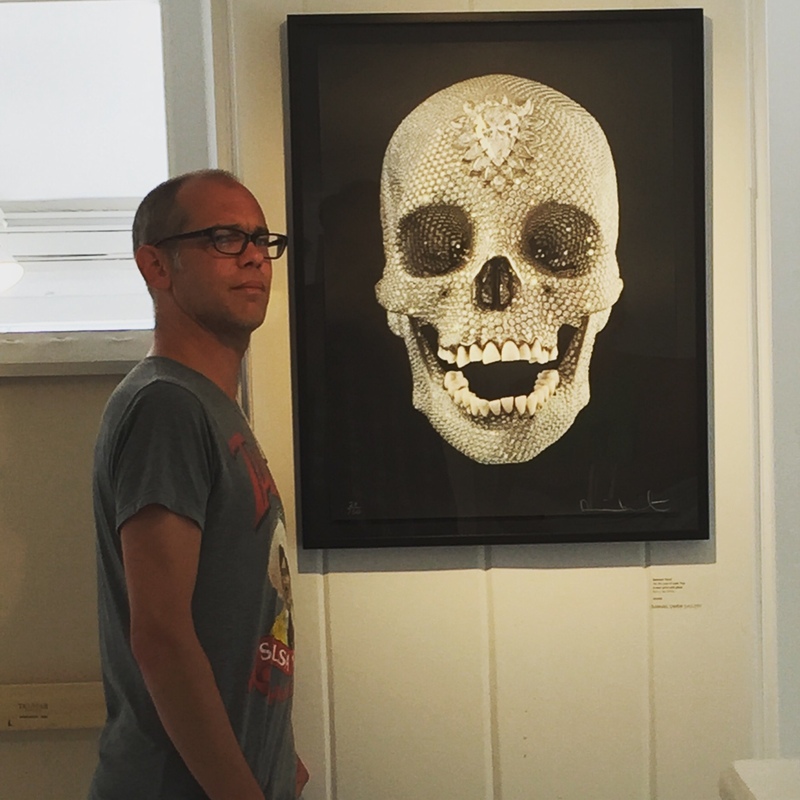 Louis with “For the Love of God” by Damien Hirst at Samuel Owen. If you have questions about the piece, whether you are a presenter, a lover of Shakespeare, or someone who has seen me perform in the past, I encourage you to leave a comment below, or get in touch with Beth Emelson at bemelson@folger.edu or 202.675.0388. In youth when I did love, did love / Methought it was very sweet / To contract, O, the time for a my behove,/ O, methought there a was nothing a meet. / But age with his stealing steps / Hath caught me in his clutch / And hath shipped me until the land / As if I had never been such. / A pickax and a spade, a spade / For and a shrouding sheet, / O, a pit of clay for to be made / For such a guest is meet. Louis as the Gravedigger outside the Folger Library. Photo by Teresa Wood. Born and raised on Long Island, New York, Louis has spent the past eighteen years working as an actor, teacher, director, and writer. From 1998-2008, he was Artist-In-Residence and Company Clown for the Aquila Theatre Company. During that time, he played in over 25 productions of the works of William Shakespeare and other classical playwrights, appearing Off-Broadway, at major regional houses, on tour in the US to 49 states and across Europe; taught over 300 masterclasses; wrote, adapted and appeared in a new production of Stevenson's "Dr. Jekyll & Mr. Hyde;" and authored numerous successfully funded grants. Other credits include Folger Theatre; La Jolla Playhouse; American Repertory Theater; South Coast Rep; LA Shakespeare Festival; Shakespeare Theatre Co, DC; Alabama Shakespeare Festival; Yale Rep; Long Wharf; Orlando Shakes; Pasadena Playhouse; Two River Theater, NJ; Alpine Theater Project, MT; La Scala Opera's West Side Story in Milan, Beirut, Nagoya, Fukuoka, Osaka, and Tokyo; many others. TV: The Knick (Cinemax), The Unusuals, and All My Children (ABC), Law & Order, and L&O: Criminal Intent (NBC). 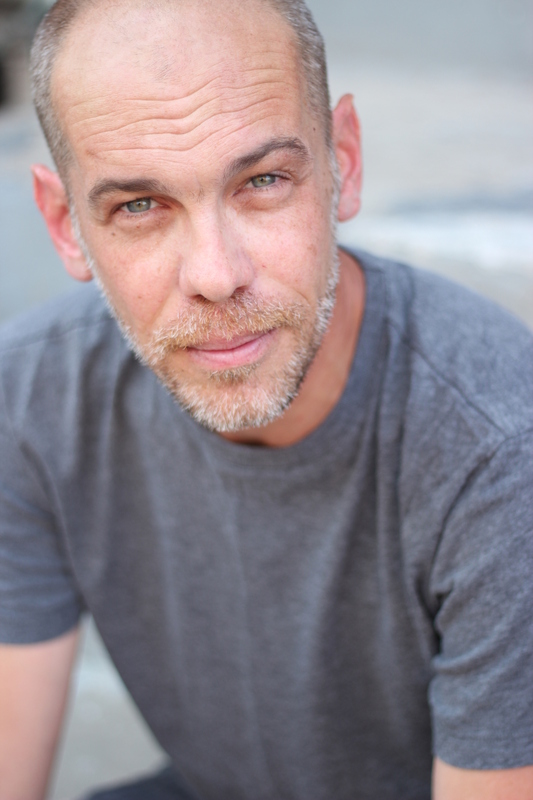 Louis is co-founder and Executive Director of Psittacus Productions, for whom he has produced "A Tale Told By An Idiot" (LA Weekly Theater Award) which performs again in May, 2015 for Lincoln Center Education, and "CYCLOPS: A Rock Opera" (NYMF Award for Excellence, 3 LA Weekly Award Noms, Pulitzer Prize Juror Nom) which has played Pasadena Playhouse, Ars Nova's ANT Fest, and a sold-out and extended run at the 2011 New York Musical Theatre Festival. Previously, he has collaborated with director Robert Richmond to make the short film, "Dreadful Sorry," financed by a generous grant from the South Carolina Film Commission, "Twelfth Night" and "Henry VIII" at the Folger Theater in the nation's capital, for both of which he was nominated for the Helen Hayes Award for Outstanding Supporting Performer, winning the Award for "Henry VIII." He is honored every day he is able to go to work in the service of a great story.